This is the bonus cupcake for the month. These happen to be my birthday cupcakes too. My sister-in-law thought it was silly that I was making my own cupcakes, but it really is something I enjoy so I thought it was a perfect way to celebrate my birthday. Especially since the hubby was at class anyway. This is going to be a short post with only a few pictures. For one, I'm tired. And for two it was stormy today so I was in a hurry to get the cupcakes done before all my beautiful window lighting was gone. As far as the cupcakes go, these little babies were so easy to make. I actually like the other banana cupcake better. This one tasted very light but I thought that might be because of the rich frosting. Overall, the cake and frosting together were delicious. 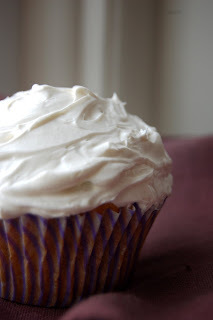 Speaking of frosting, this recipe was a doozy. Holy, time consuming. Although it tastes yummy, I'm not sure it is worth all the time. 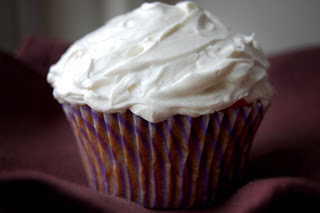 It is a knock off of a Swiss Buttercream Frosting so it is made with egg whites, sugar, vanilla, and lots of butter. The caramel had to be made separately and from scratch. I have only been successful one time in making homemade caramel. That would be on the Chocolate Salted Caramel Cupcakes. That caramel turned out fabulous! I'm not sure what the problem was today. Oh well. I didn't end up with a lot of caramel because I had to strain out some chunkies. The frosting ended up with a light caramel taste. That is all you are getting today. I will let you know more next time. You can find this recipe on pg. 41 of Martha Stewart Cupcakes. Here is the recipe for the Chocolate Syrup Frosting from my previous post. You can find this recipe on pg. 330 of Cupcakes! From the Cake Mix Doctor. 1. Place the butter, cocoa powder, and chocolate syrup in a large mixing bowl. Blend with an electric mixer on low speed until just combined, 30 seconds. Stop the machine and add the sugar, milk, and vanilla. Blend with the mixer on low speed until the sugar is incorporated, 1 minute. Increase the speed to medium and beat until light and fluffy, 1 minute more. I hope everyone is doing well. We are full force heading into the colder part of fall. It is supposed to snow up in the mountains tomorrow. As much as I hate winter, that kind of excited me. I do love to see snow up there from a distance. Happy Birthday! It's always nice to bake yourself something since then it can't go TOO wrong. 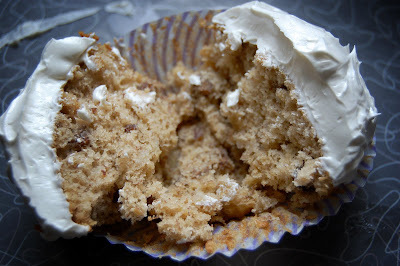 Looks great but yea the caramel frosting was super time consuming! Mmmmm...ME WANT CUPCAKE! Wish I lived closer, so I could have made you some birthday cupcakes! Love you lots. Awesome looking cupcakes! Happy Birthday! The cupcakes look great .. and it seems like not a lot of people were fans of making that caramel buttercream. I made the cupcakes and I liked them for the most part, but I added super ripe black bananas and increased the brown sugar and cinnamon for more flavor. I did not use the caramel frosting. It worked. Happy Birthday!! Your cupcakes look so beautiful! I always enjoy that first snow but I am not ready yet!!! There's nothing wrong with making your own cupcakes for your birthday! :D I'm going to have to try your frosting next time! Happy Belated Birthday! These look fantastic!!! I love the way you frosted them - perfectly done. Yes, they took some time, but I liked them both - separately though! :) Nicely done - I'm glad you made them for the Bonus Round! It makes me feel better to hear others found the caramel frosting a little too much. I was about to take the challenge and realized I did not have the time to put into it, nor the people to eat it. The results were still yummy and I am glad I made it. I didn't do the bonus challenge this month, but yours look fabulous! And I love the purple swirl liners that you used. And Happy Belated Birthday!